Great Gift! 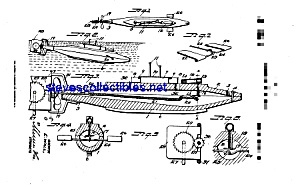 Matted and ready to pop into a standard frame: Patent Document for design of a 1910's Toy Submarine. We have other Patent Artwork on this site. Image included here is low-quality for quick loading on the net with SAMPLE written across, which will not be on your print. Your piece also will include the patent number and date.